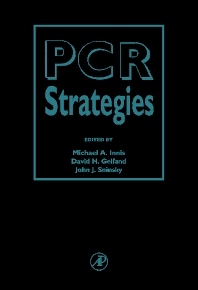 PCR Strategies expands and updates the landmark volume PCR Protocols. It is a companion laboratory manual that provides a completely new set of up-to-date strategies and protocols for getting the most from PCR. The editors have organized the book into four sections, focusing on principles, analyses, research applications, and alternative strategies for a wide variety of basic and clinical needs. If you own PCR Protocols, you will want PCR Strategies. If you don't own PCR Protocols, you will want to buy both! Principles of PCR Amplification: Preface. The Use of Co-Solvents to Enhance Amplification By the Polymerase Chain Reaction. DNA Polymerase Fidelity: Misinsertion and Mismatch Extension. Extraction of Nucleic Acids: Sample Preparation from Paraffin-Embedded Tissues. Thermostable DNA Polymerases. Direct RNA Amplification. Nucleic Acid Hybridization & Unconventional Bases. Molecular Phylogentic Analysis. The Dutp-Uracil Glycosylase System for Caryover Control and Enhanced Specificity. Quantitation. Analysis of PCR Products: Carrier Detection of Cystic Fibrosis Mutations Using PCR-Amplified DNA and a Mismatch-Binding Protein, Muts. Single-Stranded Conformational Polymorphisms (SSCP). Analysis of PCR Products By Covalent Reverse Dot Blot Hybridization. HPLC Analysis of PCR Products. Rare Mutation Detection. Heteroduplex Mobility Shift Assays for Phylogenetic Analysis. Considerations for Use of RNA: Amplified DNA Hybrid Detection Using a Monoclonal Antibody Conjugate. PCR Amplification of Vntrs. Site-Specific Mutagenesis Using the Polymerase Chain Reaction. Exact Quantification of DNA/RNA Copy Numbers By PCR/TGGE. PCR in Situ: Amplification and Detection of DNA in a Cellular Context. Chromosome Specific PCR: Maternal Blood. DNA and RNA Fingerprinting Using Arbitrarily Primed PCR. PCR-Based Screening of Yeast Artificial Chromosome (YAC) Libraries. Oligonucleotide Ligands that Discriminate Between Theophylline and Caffeine. Generation of Single Chain Antibody Fragments By PCR. Longer PCR Amplifications. Rapid Screening for Mutations Using Intercalating Dyes. Direct Analysis of Specific Bands from Arbitrarily Primed PCR Reaction. Detection of Leber's Hereditary Optic Neuropathy By Nonradioactive-LCR. Detection of Listeria Monocytogenes By PCR-Coupled Ligase Chain Reaction (LCR). 3SR as an Amplification Strategy for RNA. Cetus Corporation, Emeryville, California, U.S.A.
Roche Molecular Systems, Alameda, California, U.S.A.